When I bought my first Flex radio (5000), that used a firewire interface, RF getting into the radio was a big issue. Proper grounding would almost always fix the problem but often RF would get in on one band. Depending on the length of the ground cable, it could be a resonant length. Doing what you proposed was standard practice for Flex 5000 owners for the grounding cable. I used some old RG-8 coax and added the capacitor. In doing so you provided both a DC ground and an effective RF ground. My earlier transmitter designs used UN-balanced audio inputs and were prone to hum and RFI. Grounding one end solved the hum issue but not the RFI so tried a .001 mfd cap at the TX end as suggested and that eliminated most of the RFI so it will work OK. Finally smartened up and went to fully shielded balanced audio inputs (3 conductors) grounded at both ends and that cured it completely. The input audio amp is a little more complex but worth it. I recently went through my station fixing all the years old AC hum problems. I used probably fifteen 600 Ohm 1:1 transformers, in addition to some work on a couple of linear amps with AC issues. Now the audio is much better. If you are concerned about audio runs, the first thing you should consider is converting to balanced feeds. 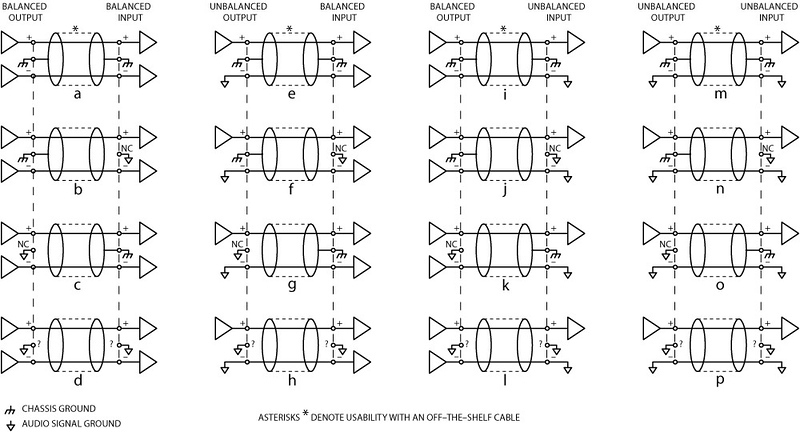 Here are some various balanced and unbalanced grounding configurations, note the labels at the very top of the columns.